Again.....remember I am just stating my opinion! 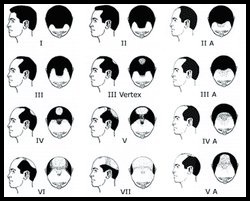 I've always noticed that successful treatment for male or female pattern baldness seemed to occur with those individuals that recently began losing their hair. This study would tend to explain why that is. Basically it shows that once a hair follicle has stopped producing a terminal hair for more than 30 months, it can never be stimulated to do so. In short we need to intervene at the first signs of the condition. Essentially, the conversion of testosterone to DHT causes the physiological response of inflammation and then fibrosis. Once fibrosis has set in....the game is over. From a more practical stand point, the best case scenario would be to stop further hair loss and regress the condition back 30 months. If you're hoping to do better than that, your efforts will end in disappointment. Understanding the "30 month window of opportunity" has some advantages for the long time hair loss sufferer. Being armed with this knowledge can prevent you from wasting time and money attempting to regrow hair that can't be regrown. Perhaps it will allow you to devote more effort in other areas that would be of better benefit to your self confidence. Getting in great physical shape could be one of them. Spending the money you would have wasted on hair loss treatments to buy a new wardrobe could be another. Irreversibility of hair follicle changes after 30 months of Androgenetic Alopecia. We studied horizontal and vertical biopsy from 15 caucasian 24-41 year old males diagnosed with bitemporal recession Androgenetic Alopecia (AA) for 1.5 –18 years (average 7.4 years). All 15 biopsies were stained with H&E, Van Gieson and with other collagen specific stainings. 1. Eleven pts with AA longer than 3 years had perifollicular fibrosis - collagen fibers were compact and formed a small scar-like formation around each anagen hair follicle(HF). Two patients - 33 year old with 18 month AA and 23 year old with 20 month AA did not have these hair follicle changes. Two 26-year-old patients with 30 and 36 month AA respectively were found to have some not so severe collagen fiber changes. 2. Infundibulum of HF dilatated 124-192 mm and most of them covered with keratinazed plug lacking normal hair shaft growth. 3. Decreased number of hair follicles 1.75-2,45 per sq. mm from 3.5-5 per sq. mm in control group. 4. None of anagen HF was situated in subcutaneous fat. We showed a correlation between length of the AA and severity/ thickness of perifollicular fibrosis. The result of this study is that any treatment of AA is recommended to start earlier than 30 months from first signs of AA. This should prevent irreversible collagen changes associated with “fibrotic incapsulation” of most anagen HF in involved areas, which usually leads to loss of normal blood supply, innervation, and subsequent miniaturization and prevention of hair from normal cycling.